The last phase of your safe and simple journey back to full exercise after having a baby. The third in a series of short, safe and simple workouts designed for new mothers. Get your body strong again with these effective, easy to learn moves. Follow your instructor through nine moves, for one minute each, with options for a pram or front pack. 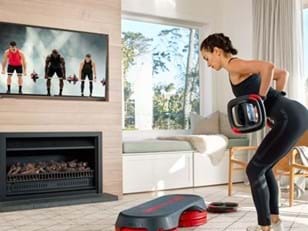 You’ll do Deadlifts, Overhead Presses, Lower ab exercises and more, and once you can comfortably complete the circuit three times you’ll be ready to move onto the next stage of your training program, which we recommend using our SMART START tools for. If you would like more advice on your journey back to exercise, join our Post-Pregnancy Facebook Community. There, you can get advice, recommendations and personal feedback from Diana Archer Mills and our team. EASE BACK INTO YOUR GYM WORKOUTS.